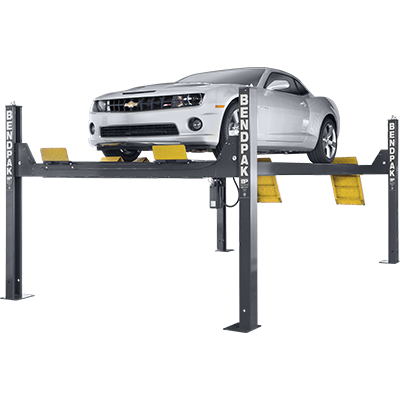 A BendPak four-post lift uses the best construction, material and technology. It also has the best safety features in the industry. 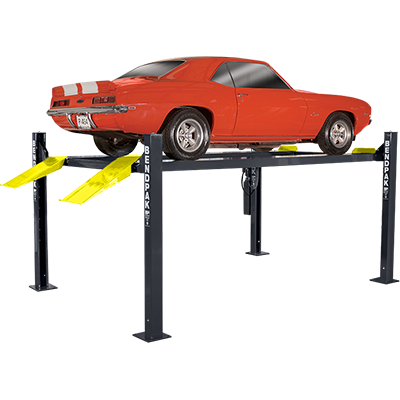 Favored by professionals and DIY'ers alike, our four-post lifts are some of the most versatile in existence. 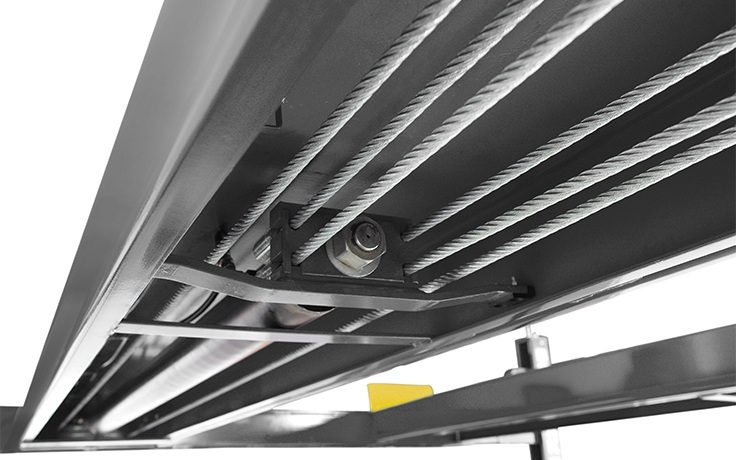 They're totally optimized for greater capacity and better performance, improving safety and control during use. 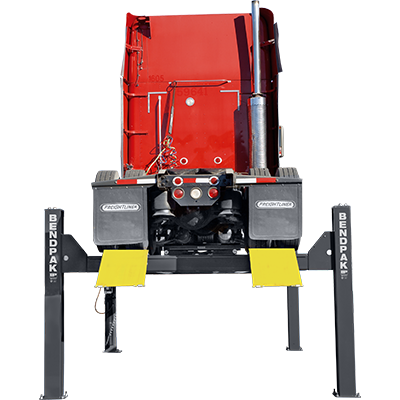 They also feature advanced hydraulic systems for better productivity and a longer lifespan. This is even true when used for the most demanding, heavy-duty applications. 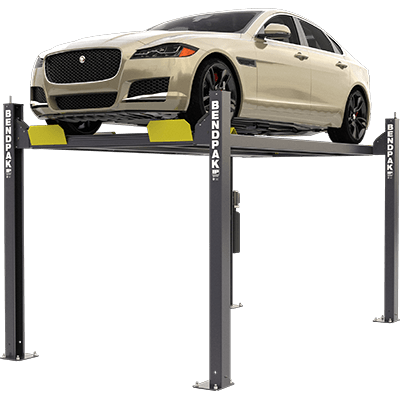 BendPak's HD-7W is the standard-width car lift model in the HD-7 series. With a 110.25” overall width and a spacious 100.25” spread between the columns, there’s plenty of room to park most cars and trucks in the lower position. This leaves ample space for you to maneuver. Starting at $3585 + FREE SHIPPING! Starting at $4480 + FREE SHIPPING! 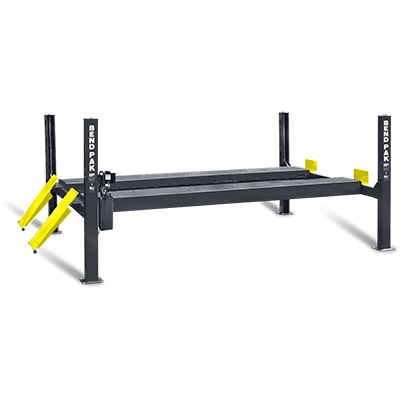 Starting at $3695 + FREE SHIPPING! 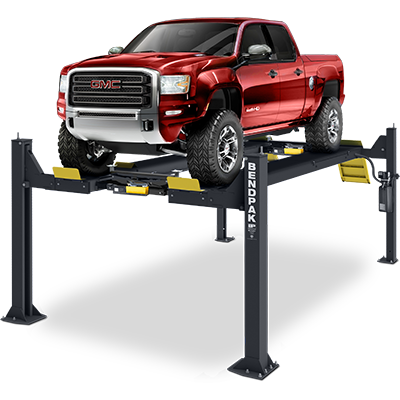 The GrandPrix GP-9XLT is a four-post lift that's 24" longer and 12" taller than the standard-length GP-9F model. Perfect for parking high-stance and/or longer-wheelbase vehicles underneath. Starting at $3965 + FREE SHIPPING! Starting at $3280 + FREE SHIPPING! Starting at $3465 + FREE SHIPPING! Starting at $3540 + FREE SHIPPING! Starting at $7755 + FREE SHIPPING! Starting at $5725 + FREE SHIPPING! Starting at $5135 + FREE SHIPPING! Starting at $5650 + FREE SHIPPING! Starting at $7430 + FREE SHIPPING! Starting at $12335 + FREE SHIPPING! Starting at $14715 + FREE SHIPPING! Starting at $16185 + FREE SHIPPING! Starting at $19890 + FREE SHIPPING! 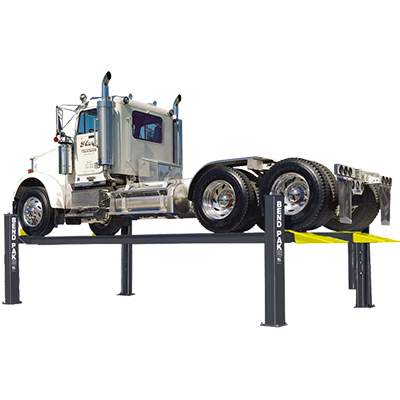 This incredible four-post truck lift handles Class 8 - 9 trucks, buses and military craft. 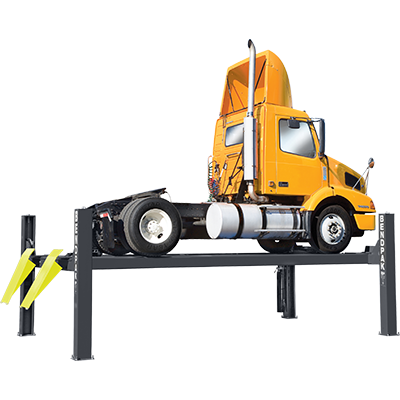 Extended-length vehicles have 310" of runway to work with, which is perfect for virtually everything in this weight class. Starting at $21880 + FREE SHIPPING! Starting at $23895 + FREE SHIPPING! Starting at $26285 + FREE SHIPPING! 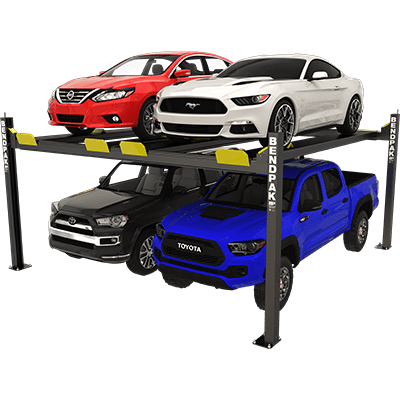 Which four-post lift is best for my ​shop? 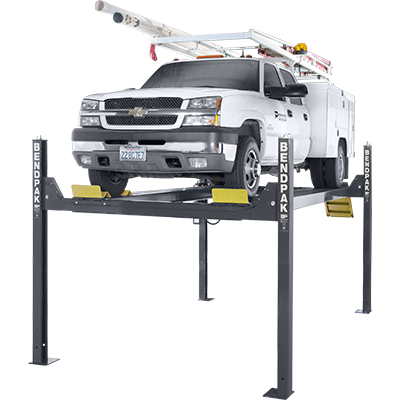 Ever since our high-capacity four-post lifts hit the market in 1984, the BendPak logo has inspired confidence in service professionals worldwide. These are people who spend much of their lives beneath vehicles lifted with our equipment. Of course, much has changed in the way of technology since the early days of BendPak. What hasn't changed is our commitment to the end-user and the care we put into each four-post lift. 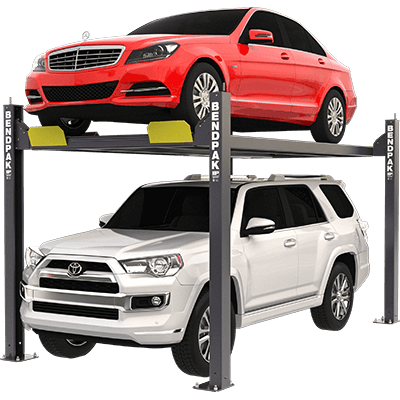 BendPak lifts are engineered to meet the demands of any lifting job. 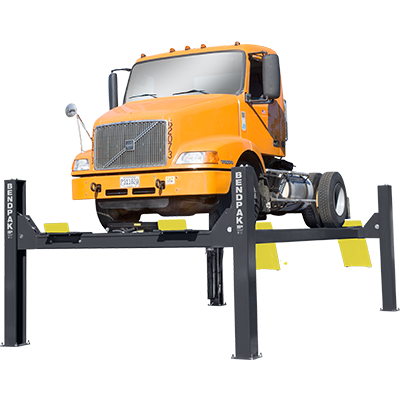 Lift capacity ranges from light-duty 7,000 lbs. to heavy-duty 40,000 lbs. 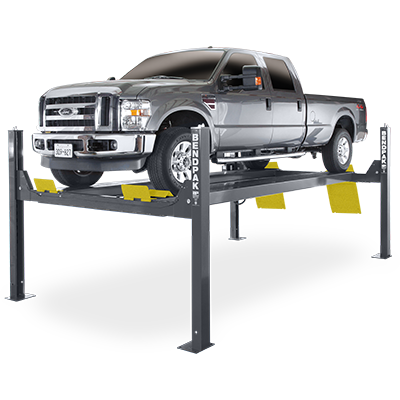 If it drives, one of our four-post lifts can probably handle it. 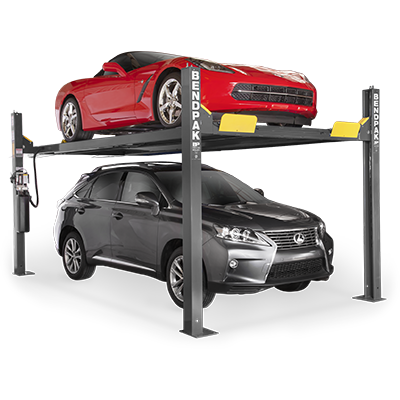 These ​automotive lifts also pull double-duty as convenient parking and storage solutions. 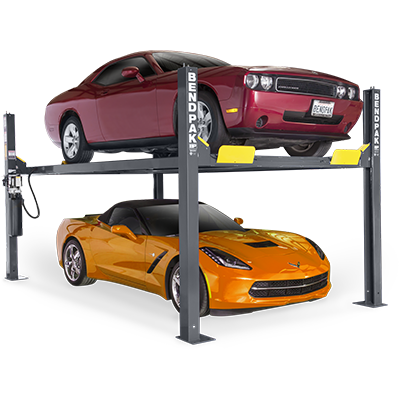 Securely leave your weekend car raised on the lift and easily park your day-to-day ride beneath it. 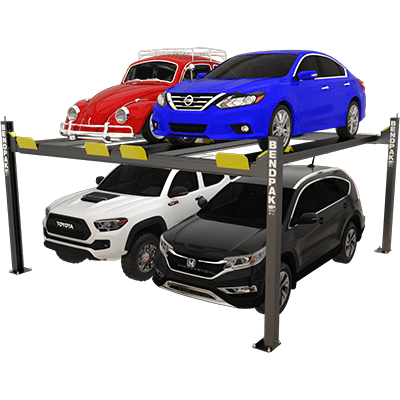 Many of our four-post lift models let you choose between several options: super-tall, wide, narrow, space-saving or regular. 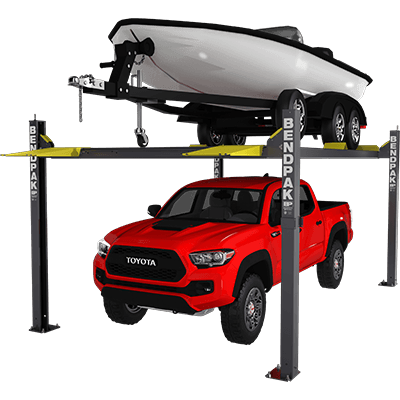 You're sure to find the perfect four-post lift for your needs. 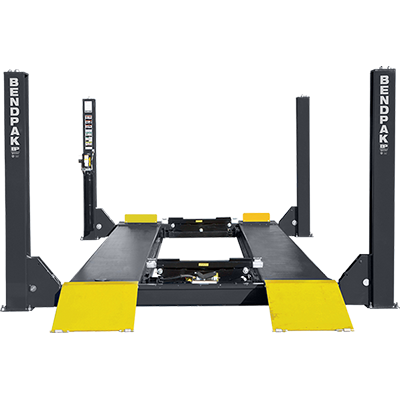 All BendPak lifts are backed by 50 years of excellence and a reputation that carries as much weight as the lift itself. 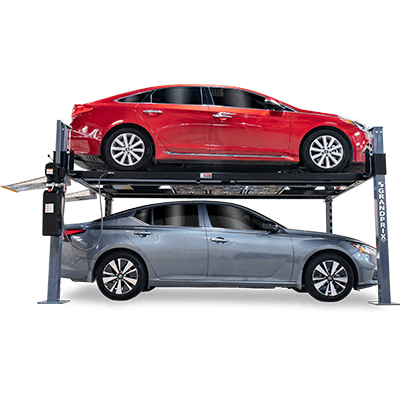 We're proud to have these four-post car lifts in our lineup, and you will be too. 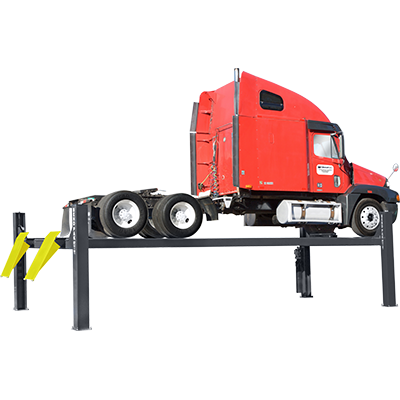 A suite of accessories and options are available, including rolling bridge jacks for full wheel service. 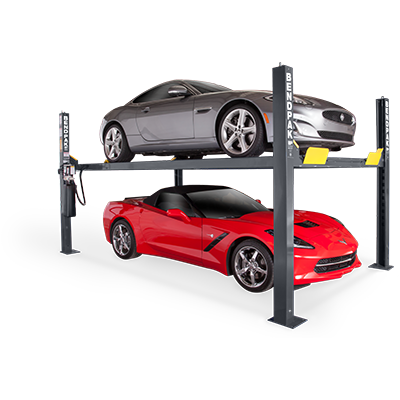 Part of what makes our four-post car lifts as sleek as they are efficient is the way we hide components that would otherwise disrupt the look of the lift. To keep the hydraulic cylinder hidden, we tucked it beneath one of the drive-on ramps. 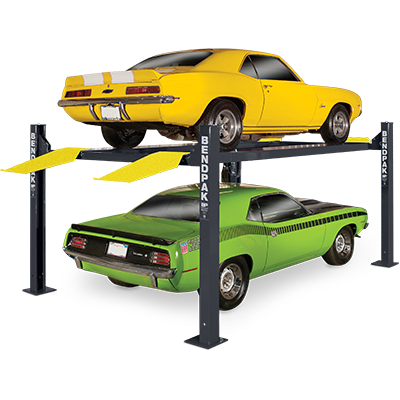 This leak-proof cylinder technology is only available for BendPak four-post lifts. 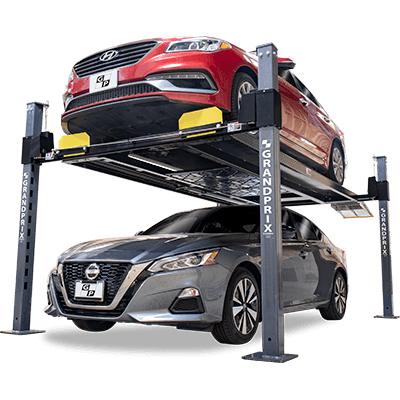 Each car lift is equipped with a single hydraulic cylinder hidden away under the runway for minimum exposure and maximum reliable performance. Our industrial-grade hydraulic cylinders feature a single-piece, pilot-fitted, machined steel piston wrapped with specially-designed, pressure-loaded U-cup piston seals, backups and wear bands to virtually eliminate fluid bypass. The micro-smooth chrome rod is machined from high-yield, ground and polished C-1045/50 micro-alloy steel and plated to a minimum of .001" diametrically, which ensures superior cylinder operation and life. The superior, high-durometer, mechanically-loaded rod seals make rod leakage a thing of the past, while a specially formulated abrasion-resistant urethane rod wiper provides exclusion protection. The welded cylinder body is made from robust steel tubing produced to exceed ASTM specifications. This combination of superb base material and superior processing ensures that the cylinders remain straight, smooth and last an exceptionally long time. An integrated flow restrictor provides a controlled descent in the case of unexpected hose rupture.